Crazy Mountains from Wilsall, Mont. The rugged and unforgiving Crazy Mountains have always held their share of secrets. Take the name, for instance. 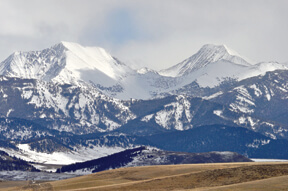 According to the most popular legend – and the one that is perhaps least politically correct—the mountains were anointed in memory of a woman whose family of homesteaders were massacred by Indians while she was out walking at the base of the majestic peaks. When the alleged perpetrators returned a week later, she burst from the cabin and attacked them using a tomahawk that had been used to slay the oldest of her three sons. The Indians retreated, watching in dismay as the “Crazy Woman” fled into the wilderness, never to be seen again. Hence, the Crazy Mountains. Since last autumn, the Crazies have held a new mystery, one filled with both frustration and sadness. Aaron Joseph Hedges, a 38-year-old, well-regarded hunter from Bozeman, was last heard from on Sept. 7, 2014, and to this day he has not been found. Even after the discovery of his bow and backpack in mid-June briefly offered hope, the case remains open, as law enforcement officials attempt to find answers to a riddle that may never be solved. While the hunters became separated on Sunday, Hedges wasn’t reported missing until his wife, Christine, notified the Sweet Grass County Sheriff’s Office on Wednesday, Sept. 10. The duration between the time Hedges went missing and the authorities being notified did raise some eyebrows, especially among amateur sleuths on social media who made instant, unabashed accusations of foul play. Even Ronneberg, an experienced bow hunter, did concede that the time lapse might seem peculiar. Todd indicated that he believed Hedges’ friends made an earnest attempt to find him. “Oh yes, oh yes,” he said. Whatever the reason for the time lapse before Hedges’ disappearance was reported, it had its consequences. Search crews entered from the Park County side, focusing their efforts on the area that stretches from the Cottonwood Lake Trail to Trespass Creek. According to authorities, the hunters had begun their trip at the Cottonwood Lake Trailhead. “We got two feet of snow, and it was snowing hard,” Todd said. “We actually deployed a horse team based on what we had initially. They made it as far as they could—maybe even farther than they should have—and came back out. It was snowing hard, (and) the temperature dropped 35 degrees. It was tough—very cold, very wet. Probably in the teens, if I remember right. The horse team got back well after dark, but we didn’t search in the darkness in the snow, (because) that’s not safe. The effort according to Park and Sweet Grass counties “exhaustively searched the Crazy Mountains east of Wilsall” and included 20 dog teams, seven horse teams, 59 ground searchers, and National Guard and private helicopters equipped with night-vision equipment and spotlights. By Sept. 22, officials decided to scale back the search until they received more information. That moment arrived this past summer, when Roger Beslanowitch, a butcher from Powell, Wyoming, happened upon Hedges’ belongings while visiting relatives at the Anchor Ranch in Sweet Grass County. Beslanowitch’s inventory at the scene included a “bow, backpack, socks, shirts, sweatpants and a vest.” The backpack had holes in it, which he assumed were caused by small varmints. Wrappers from granola bars, along with other debris, were scattered nearby. Could it be, that being hypothermic and disoriented, Hedges removed layers of clothing and headed in the wrong direction? Yet, if the hunters began their trip from the Cottonwood Lake Trailhead on the west side of the mountains, and Hedges was bound for Sunlight Lake to the north, how did he end up on the east side of the range? The distance he would have had to cover was perhaps 15 miles, much of it off-trail and arduous. With a ruthless storm coming in, the decision to travel east along the Sweet Grass drainage would have presented a considerable challenge for even the most experienced outdoorsman, and Hedges would be almost certain to lose radio contact. With the case still open, law enforcement officials would not disclose the identity of Hedges’ hunting companions. Both men were interviewed by Park County Det. Brian Green, a routine procedure in this type of investigation. When contacted, Green declined to add any further comments beyond those offered by Hamilton and Todd. While Hamilton said authorities “have to look at all possibilities,” he seemed to indicate that Hedges likely died from natural causes. Missing from the evidence is the fact that Hedges has not been found. While not unheard of in missing persons cases, this element is what stands in the way of ultimate closure. In the meantime, the questions will remain. How long will the case remain open?